Surrounded by the spectacular Remarkables mountain range and fringed by the meandering bays of Lake Wakatipu, Queenstown is a city marked by its breathtaking natural beauty. But for those who have been lucky enough to visit Queenstown, they will know that this small city is also packed full of activities, making it the perfect destination for the adventure loving traveller. For those willing to brave the icy elements, Queenstown offers a whole heap of fun. Skiing, snowboarding, ice climbing and so much more awaits in this winter wonderland, offering everything the outdoor adventurer could possibly want. It’s no surprise that Queenstown is often referred to as the adventure capital of the world. If you’re a fan of helicopters, you’re in luck. The best way to see Queenstown is from above, and the landscape lends itself to some serious heli action. There aren’t many places where a helicopter can’t go, and you can find yourself flying over mountains, alpine lakes and even glaciers. If flying isn’t your thing, Queenstown also offers a number of scenic drives which can still lead you to some fairly impressive viewpoints. If you’re looking for a snow-based adventure, Queenstown is the ultimate winter break. With the closest ski field just 20 minutes from the vibrant town centre and an international airport located even closer, Queenstown is the perfect base for a snow experience you’ll never forget. Offering one of the longest seasons in the Southern Hemisphere, Queenstown welcomes skiers and snowboarders from June to October. There are four ski fields to choose from, each offering unrivalled alpine scenery, world-class infrastructure and brilliantly varied open and treeless terrain. Ski passes range from single day, single ski areas passes, to season passes that allow unlimited access to multiple Queenstown ski areas. Located just 22 minutes from Queenstown, Coronet Peak sees an average of 2.1m annual snowfall and offers spectacular roller coaster terrain. Suitable for snow lovers of any ability, you can take to the tracks from 8am daily or enjoy night skiing on Fridays and Saturdays. Coronet Peak also hosts a number of events throughout the season ranging from the Winter Classic Race Series to Singles Night Ski. The Remarkables ski field is located just 35 minutes drive from Queenstown and offers an authentic alpine mountain experience. The terrain and facilities are suited for all levels of skiers and snowboarders, from first timers to the most seasoned snow veterans. Average annual snowfall is 3.67m, but the park also features 100 snowmaking guns that cover 7 trails over the 3 terrain parks. If you’re visiting with young children, Swikiland Early Learning Centre offers age specific programs for children up to 5 years old, which include small group ski lessons. Nestled high in the Southern Alps between Wanaka and Queenstown, Cardrona is a friendly and relaxed ski area that offers world class parks and pipes. Whatever your level, it’s got something for you. The park is not just limited to skiing and snowboarding, you can also enjoy mountain biking, carting and hiking at Cardrona. For the more advanced skiers and snowboarders, Cardrona’s Big Bucks Park is packed with jumps and jibs that will really test your abilities. 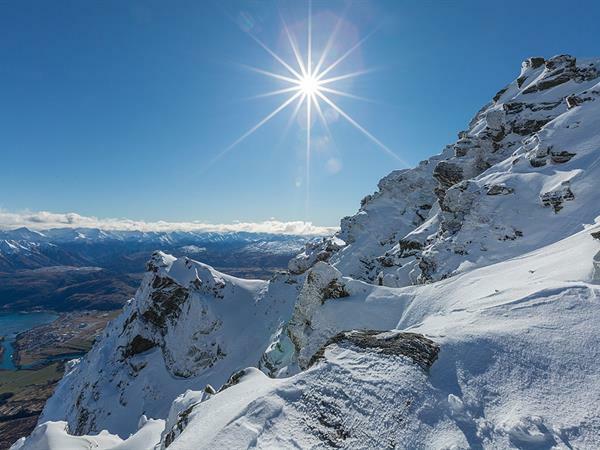 Treble Cone is a 90 minute trip from Queenstown and is the largest ski field in the Queenstown Southern Lakes District. Covering 700m of leg burning, vertical terrain, Treble Cone is renowned for its long runs and uncrowded trails. Treble Cone offers 550 ha of rideable terrain, half of which will certainly get the heart pumping. Although this park is certainly one for the daring, beginners shouldn’t fear as Treble Cone also offers lessons and free lift access to the ‘Nice n Easy’ surface. There’s a little-known truth about heli-skiing in Queenstown, and that’s that almost anyone can do it. Many visitors to Queenstown are fooled into thinking that heliskiing is restricted for the experienced, off-the-grid style skier or boarder, and that you have to jump 10 feet out of a hovering chopper with your skis or snowboard strapped on. But guess what? If you can make it down an intermediate slope in one piece, you’re good to go. Queenstown heli skiing options are endless and there’s a package to suit every level of experience. With so many options available, it’s also relatively inexpensive. Most heli-ski companies will offer classic four-day runs for example, for around NZ$850. A typical day heli skiing looks something like this: you get picked up and transferred to a helipad, given a safety briefing, take a chopper ride, go down a few magic runs, have lunch on the mountain, go down another few magic runs, enjoy a few beers, then get a lift back to your accommodation. There’s no better way to explore untouched terrain and fresh powder than heli skiing in Queenstown. Queenstown Snowmobiles offer the only wilderness snowmobiling adventure in New Zealand. The exclusive back country trails are accessible via helicopter only, which offer breathtaking views across to Mount Cook and Mount Aspiring on a clear, sunny day. Queenstown Snowmobiles offer tours for individuals and groups up to six people, from July to late October. Queenstown’s mountaineering expeditions offer some of the most accessible Alpine environments in New Zealand, with mountain guides specialising in the iconic mountains of the Southern Lakes region, Aspiring National Park and Mount Cook National Park. Climbing Queenstown offers guided mountaineering trips to suit every skill level, with walks ranging from one day to three day long expeditions up the biggest mountains in the Wakatipu basin. The three-day climbing trip to Mt Earnslaw will see you climb 2830 metres! If mountaineering isn’t your style, Climbing Queenstown also offer rock climbing, abseiling and snow shoeing adventures. Back in the times when skiing was more than just a pastime of holidaymakers seeking a thrill, skiing was a means of getting around for Scandinavians. For the Sami people of Northern Norway, Sweden, and Finland, it was pretty much the only way to get from A to B. Rather than using lifts or other assistance to get across the terrain, Cross Country or Nordic Skiing relies on the skier's own strength and locomotion to move. As such, it is a rather different experience to downhill, alpine skiing, with some describing it like bushwalking with ski’s on. With New Zealand’s gorgeous mountain scenery, cross country skiing is is a fantastic way to explore. Undoubtedly the best place to try it is at the Waiorau Snow Farm, 35 km from Wanaka and perched high above the lake. Queenstown’s stunning landscape, huge range of activities and unique energy create the perfect setting for a holiday filled with exploration and thrilling adventure. Winter in Queenstown will truly take your breath away.